The Unique Blogger Award + The 25 Things That Make Me Happy Tag! Hey guys, what’s up? I am super pleased to announce that I have been nominated for the Unique Blogger Award, thanks to Emma from Dazzling Dollies! Thank you SO MUCH, Emma!!!! What is the next doll that you want? My favorite part about blogging is when people tell me that I inspire their own blogs. This makes me really happy! Also, when people tell me that a comment I left “made their day,” I feel very pleased. I love making new friends while doing something I love! My favorite TV show is Project Mc², even though it is kind of young for me. I also like to watch When Calls The Heart, which is a Hallmark Channel romance TV show. My next doll . . . well, either Luciana, though I probably won’t get her, or another custom. I have one in mind, maybe to do later this year . . .
You guys get to answer these questions! Do you play any sports? What is your favorite one? I know that’s more like four questions, sorry . . .
And now it’s time for the 25 Things That Make Me Happy Tag! I was tagged by Enni (although technically she tagged anyone who has flown on a plane and I have done that countless times), so thank you SO MUCH!!! Doing laundry! I LOVE LOVE LOVE doing laundry! Getting new bands on my braces! I have an appointment in about a week, and I don’t know what colors I should get – any color combination suggestions? THE MAGIC OF PHOTO EDITING WEBSITES (which I only recently discovered)!!! I tag anyone who has traveled internationally! Prepare yourselves, people. This is going to be one big blog post. Remember how I had all of my posts scheduled for the month of November? Because of that, I was unable to do tags or awards. Now that’s it’s December, I can do the SIX awards and tags I’ve been nominated for!!!!! Like I said, long blog post. However, there is one tag I will not be doing until later on this month. It is The Holiday Tag, and I was nominated for it by the Blogging Doll Sisters. The reason I am not doing it today is because it involves having holiday decorations up and mine will not be revealed for another week or so. Because I have five entire tags/awards to do, I may not be able to nominate/tag the specified number of people for each one. Sorry about that. I’m aiming to select two-three people for each. Without further ado, let’s get started with the Blogger Recognition Award! 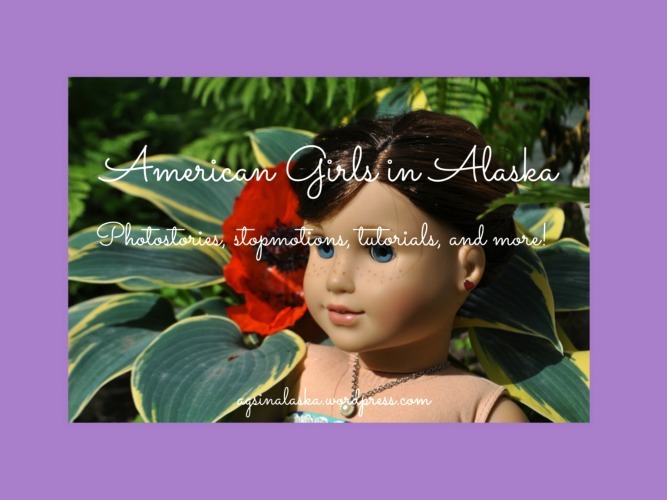 I started American Girls in Alaska right after I finished my previous blog. I really wanted to have a blog, so I got my mom’s permission and started thinking about what kind of blog I wanted it to be about. I was trying to decide between a pet blog or a doll blog when Loren from Happy House of AG inspired me to start a doll blog! I realized how fun it would be to do one. My two pieces of advice are . . .
DON’T let blogging take up all of your time. You can easily get sucked into your WordPress reader and notifications bar, replying to comments and whatnot. Get all of your schoolwork/chores done FIRST. DON’T let other blogger’s blogging styles make you feel like you should change your own. Don’t compare your pictures, writing styles, etc. to yours. You are a unique blogger – don’t change! The bloggers I choose to nominate are . . .
A: Vanilla Chai tea. I drink this year round, but it seems to fit best for fall. Q: Apple cider or pumpkin spice? Q: Pumpkin pie or apple pie? Q: Red, orange, and yellow or yellow, white, and orange? A: Yellow, white, and orange. Q: Scary costumes or cute costumes? A: The chill in the air, promising that snow is just around the corner. Q: A football game or football shaped cookies? A: Since football is less interesting than watching paint dry, I’m going with cookies. A: A cozy sweater and my favorite pair of jeans, with some fuzzy socks. Q: Do you love the colors or the scents of fall? Q: Pre-made fall crafts or DIY ones? A: I’m not super crafty, but I’m going with DIY. Q: What is your AG dolls favorite fall outfit? A: The one Emily is wearing here. Okay, that’s alll for the questions! I have decided to tag The Blogging Sisters and AG Doll Adventures and Lizzy! Have fun, you guys! Your questions are . . .
What is your favorite color of leaf – red, orange, yellow, green, or brown? Have you ever done a fall photoshoot? What is your favorite doll sweater? What is your favorite part about Thanksgiving? That is, assuming, you live in the US. Pumpkin pie, apple pie, or pecan pie? Did you know that there was no pumpkin pie until the second Thanksgiving? Do you like Halloween or Thanksgiving better? Did you go anywhere for Thankgiving? Did anyone visit you for Thanksgiving? Was there snow on the ground where you live for Thanksgiving? Okay, that’s all for the Fall Themed Tag! And now, we’re moving onto the New Blogger Tag! 1. What do you like most about AG dolls? Their hair and facial features, as well as their unique personalities. 2. Why did you decide to start a blog? I have blogged before, and I love connecting with my followers! 3. Do you shop on Etsy? No, I never have. But I have checked it out before. 4. Do you follow any non-AG blogs? 5. What’s your favorite jungle animal? In the summer, outdoors. In the winter, indoors. 7. Do you like being tagged? My questions for you three are . . .
How do you come up with ideas for posts? Is it difficult to manage school, family stuff, chores, and blogging? Give them 11 new question to answer. Q: Do you like Lab Rats? If so, what’s your favorite episode? A: No, I have never seen it. Q: Would you rather have the power to rewind time or pause time? A: Rewind! Definitely rewind! I would go back and fix embarrassing mistakes and relive happy moments from my childhood. Q: What job would you be absolutely terrible at? A: Politician/President of the United States. I am really not very commanding and I don’t like to hurt people’s feelings. Q: If you ruled your own country, who would you get to write the national anthem? A: I would probably write it myself, since I’m a writer. Q: Would you rather have a unicorn horn or a squirrel tail? A: Oh, geez. A squirrel’s tail, because I could probably hide it. A: Books! BOOKS BOOKS BOOKS BOOKS BOOKS! Q: Would you rather be an adult your whole life or a kid your whole life? A: Wow, this is a really hard one. I’m going to have to say a kid, because you have less responsibilities. Q: Would you rather be locked in an amusement park or a library? Q: What’s the grossest food combination you can think of? A: Froot loops, milk, and ketchup. Q: If you were challenged to a duel, what weapons would you use? A: A sword, and probably a long-handled broom. Hors d’oeuvres or a five-course meal? Do you blog on a computer, phone, or tablet? How many followers would you like to have by the end of the year? Do you think it’s okay for older teens/adults to like dolls? Have fun with the questions, everybody! Lastly, I was nominated by Jenna, The Blog Dolly, for the Versatile Blogger Award! (VBA for short.) Thank you so, so, so much! Okay, I cannot nominated fifteen people, so I’m going to do as many as possible, and then anyone else who wants to do it is welcome to. I’ll be back on Monday! See you guys soon! And create 11 new questions for your nominees! If you could visit any country with every expense paid, which one would it be? Will you ever stop blogging? If you had to eat one food only, for one entire month, what would the food be? Yes, I like Pokémon. My favorite is Ninetails. In my spare time, I read, write, and blog. And watch YouTube, much to my mother’s dismay. I play the piano (and I love singing, but that doesn’t mean I’m good at it). France. Francefrancefrancefrancefrance. More specifically, Paris! I already speak French. I blog because I want to. Just kidding. I blog to share my AG ideas with other doll lovers! I started blogging for a journalism assignment. This is actually not my first blog, but I finished my last blog and missed blogging so I started a new one. Probably, when I go to college. French toast. Although that is a combination of foods . . . in not French toast, then watermelon. No, not really. It’s a frustrating subject for me as I am not naturally gifted in art and everything I drew looks weird. I will nominate . . . the people above! Have you ever been ziplining? What doll would you like to have? Do you like Gabriella McBride (GOTY 2017)? That’s all for now! See ya later! I will nominate . . . Inform the people/blogs that you nominated that they have been nominated for the Liebster award and provide a link for them to your post or mine if you don’t have all the information so that they can learn about it (they might not have ever heard of it)! Do you believe Pluto should remain a dwarf planet or be a regular planet again? Do you believe in God and in his Word, the Bible? Who’s your favorite singer or band? Do you like the show Jessie? What do you believe happened to the dinosaurs? My favorite show is Last Man Standing. My greatest fears are elevators, tsunamis, and large hairy spiders. My favorite animal is the red fox. And Pluto deserves to be back in the rankings as a planet again! I do believe in God and His Word. My favorite Bible verse is 1 Corinthians 13:13. My favorite singer is Brit Nicole. I like Jessie but I’m not allowed to watch it anymore. And as for the dinosaurs, um, #Ihavenoidea. And then one more random fact is I hate almonds. Q: If you could ask the president one question, what would it be? A: Do you ever get scared? Q: What trait do you like most about yourself? A: I’m very compassionate and understanding. Q: What are your talents? A: Writing, and I’m good with animals and little kids. Q: If you could shop for free in any store, which one would you choose? A: AG Place Los Angeles. It’s awesome there. Q: Would you rather be the best player on a horrible team or the worst player on a great team? A: Best player on a horrible team! Q: What personal trait has gotten you in the most trouble? A: Uh . . .
Now, I’m going to do what The AG Homeschooler did and the people I nominate are the first five people who comment on this post and say that they want to be nominated. Since my blog requires me to moderate all comments, I will moderate them in the order they are sent to my email inbox. I will then post on my blog saying who the nominees are and then they can go ahead and write about the award on their blog. Congrats in advance, guys! Thank the person who nominated you and leave a link to their blog/blogs. Answer the 5 questions given. Nominate 3 bloggers with 30 or less followers. Ask them 5 questions about their blog. So here’s my thank you to The AG Homeschooler! Check out her blog here: agswondrousworld.wordpress.com. What’s one thing you’ve learned about blogging so far? Who was your very first follower? How long do you think you’ll keep blogging? I decided to start my blog so I would be able to share my AG ideas with the online community. I was NOT out to become a popular blogger. 🙂 Actually, online privacy is pretty important to me. I came up with my blog’s name because I live in Alaska and Alaska and American Girl start with the same letter, so . . . yeah. A thing I’ve learned about blogging is that when you do photoshoots, your WordPress media space fills up very quickly with your pics. 🙂 🙂 🙂 My very first follower was my best friend. I think I’ll keep blogging for a long, long time! I love dolls! Is blogging something you’d like to do your whole life? Who inspires you to blog? Is blogging on your Top 5 favorite things to do list? Will you continue your blog as an adult?